Oregon Trail Rally (OTR) 2012 was a three day event. Friday evening stages were at Portland International Raceway and were more of a shakedown / fan appreciation thing and not much of a rally. Saturday and Sunday are the meat of the event. It is not possible to win the event Friday but it is certainly possible to lose Friday. But before all that, there are some preliminary things to deal with. Like recce on Thursday. 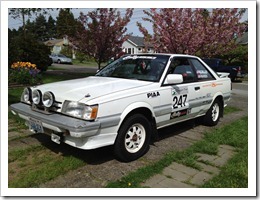 Recce for the 2012 Oregon Trail Rally was scheduled for Wednesday and Thursday. Wednesday was for the cars "invited" to the press stages on Thursday and as you may well imagine, a 25 year old Subaru and a first time driver were not invited so our designated recce was Thursday. Recce registration was from 6:30am to 7:30am at a restaurant in Portland close to PIR. In order to get there on time we needed to be out of Seattle very early Thursday. Wednesday night at 8::00pm we met up with Kathryn (co-driver for the weekend) and Steve (Car 000 and general team support) at the Northgate Park and Ride. Due to his massively generous nature, Steve has volunteered use of his trailer and a truck to get the rally car down and around Oregon. Steve and Kathryn had loaded their car on the trailer and drove it down to Seattle where they met up with the Seattle team (me, (driver) Joe (designated crew chief), and Hans (designated crew captain)). We unloaded Steve’s car and took instruction on using the trailer and loading the Subaru. Then Steve and Kathryn continued their drive south while Joe and I attempted to drive the truck/trailer over to my house. Note: The trailer in use this weekend is the same one that was used to extract a Saab and a BMW from Canada one wintery weekend. It is HUGE. It’s big enough to hold a Ford Excursion so the Subaru was an easy load. But the trailer is LONG, the truck plus trailer was in the neighborhood of 40 feet log, making maneuvering through the tight streets of Seattle a challenge for the relatively inexperienced crew. Still, we managed. Joe and I crashed at my house for a few hours before waking at 3am for the drive down to Portland. An early departure was ideal for getting familiar to the characteristics of the truck and trailer at speed. Sure, we were tired, but our weaving down the road was a lot easier without much traffic. We arrived at the recce registration location before 7am, meeting up again with Steve and Kathryn as well as Marinus and Renee Damm who brought Marilyn (their BMW 325IX) with them for us to use as a recce car. Note: Rally America does not allow rally cars on recce. You need to use a different vehicle. So at 7:30am Kathryn and I headed out from Portland to the Dalles and Dufur stages. The was no recce for the PIR stages; they were short and the parade lap at the beginning of Friday night alleviated the need. Which would translate to a easy right turn (5-) over a crest then 50 meters and then a square left turn (L 3) and then 200 meters before the next instruction. The weather all week had been rain/wet/ick and Thursday was no real exception. While the first stages around the Dalles were fine (apart from some light snow at one point – really, snow in May), as we got up into the Dufur areas the ground, usually light dust and dirt, turned to quicksand. A competitor recce car behind us got stuck and we had a hard time getting out of one mud pit, even with the all wheel drive. And then, after we were 1/2 way through the second Dufur stage, we were stopped. The rally officials called off the rest of recce in order to preserve the roads for the weekend. So we transited out and back to Portland. We gathered some very good information on how to work together for the rally but were unable to run the entire course. During the time that Kathryn and I were out on recce, Joe drove the trailer over to Trackside Motorsports, Garth Ankeny’s shop. Through previous arrangement, Garth had offered his locked yard as trailer storage for Thursday evening. Garth is a good guy. Kathryn and I drove back to Portland and met up with Joe at the Damm’s house (our lodging for Thursday night). We dropped the BMW off (wet, muddy, and happy) and took the service truck for a late lunch. Picking up food for Steve, we drove over to PIR where the press stages were wrapping up. That night, the Scion Rally Team was hosting a party for the competitors and crew in Portland so Joe, Marinus, Renee, and I piled into a car and headed out. There was beer, tacos, scantily dressed babes, energy drinks, and other related hoopla. Scion drive Andrew Comrie Picard worked the room like a humble celebrity and both Joe and Marinus posed for photos with the NOS Energy Drink girls while showing off the TeamD colors. It was good. Friday morning Joe and I left Damm mansion early. Renee and Marinus had to “work” for a while but we’d see them later in the day. We grabbed the service truck and headed over to event registration to get our papers and credentials and all sorts. Then we picked up the car and trailer and headed out to PIR. Somewhere in here we also bought a 10×10 easy-up but I don’t quite remember when. At PIR we unloaded the car, ditched the trailer, and lined up for tech inspection. At tech you need to show the car meets regulations. You also need to show all the required safety gear, driver’s gear, and the vehicle log book. And that’s when tragedy struck. The log book, the thing every car needs to be legal, the record of it’s entire career. Missing. I could not find it anywhere. It usually lives in the glove box and is not separated from the car. But it was nowhere to be found. And without a log book the car could not be entered. I had a feeling (a correct one) that the log book was on my desk at home. But at this time it is noon and there’s not enough time to drive to Seattle, pick it up, and drive back. Hans, who was meeting us on Friday to complete the service crew staffing, was already in a train headed to Portland. But a combination of technology and familiarity saved us. I had scanned every page of the log book and placed them online for review by Rally America prior to getting the cage re-certified. I was able to pull up the log book on my iPad and with that and Kathryn’s sweet talking we were passed through tech. I think the official comment was “log book missing but verified by concrete evidence”. Passed through tech, I drove the rally car out into line to be passed to the infield of PIR. The track was being used all day by a local sport driving club so we had to wait for breaks in their lapping to get to the infield service area. Once inside, we were assigned our service location and we started to set up service. We put up the canopy (which was essential when the rains came, and they did), rolled out the tarp, and set up service. We then popped the car onto jack stands and Joe and I bled the brakes which were feeling a bit spongy. This was fun as neither Joe nor I had done this before. Luckily the TeamD service ended up also as the pace car collection point so we had no end of advise and suggestions. Around this point, Hans arrived. Ron in Car 00 picked him up from registration and transported him to our service location. Now with a full service crew of Joe and Hans, things were humming. Tires were swapped, brakes checked, lines checked, etc. All sorts of mechanical things happened. I tried to stay out of the fray, excepting the job of applying decals and making a nuisance of myself. OTR had 60+ entries. Soon the service area was full of cars and teams. Big panel vans, trucks, RVs, semis full of parts, sponsor tents, the place started to feel “professional”. Little TeamD in the corner with a white pickup felt somewhat out of place. But then people started showing up. Spectators. People that paid $10 to come see the show. And a few of them even came by and talked to us. And were amazed. “What is that?” “Is that an RX?” “Does it run?” and similar quotes. Sincere wishes of good luck came our way. And then Antoine L’Estage came by. Team Mitsubishi and leading the Canadian Rally Championship. And he loved the little RX. His crew were impressed (the ones that knew what it was). And TeamD felt a bit better. There were four stages on Friday evening. Stages 1 and 3, identical, started on the track. The course headed down the main straight, with a right hairpin at the end, coming back up the other side of the barrier, then a left onto a service road, hard right out around the perimeter of the property, onto gravel, around some curves, back onto tarmac, and around to the finish. Stages 2 and 4 had more gravel and “sod” as they wound around and through the motocross park. At least that was the plan. The parade lap proved that the sporadic rain during the day had turned the motocross park into mud soup and some of the sod had turned to mush so they changed the course after the parade lap (and after they towed a car that got stuck in the muck on the parade lap) and redirected around the bad portions. The PIR stages were run reverse order, meaning the slowest cars went first. Luckily I was not “first”. But as I lined up for the start of Stage 1, and as Kathryn attempted to roll up her window after getting the time card, well, the window would not roll up. This would cause problems as regulations state the window has to be open no more than 1/2 inch. So the seconds tick down and I start on time and we’re trying to get the window rolled up and it won’t move and perhaps the motor has died or the switch has died and it’s my first stage and I am trying to go fast but it is a real distraction and here comes the hairpin and I didn’t get to the speed I wanted and it feels sooo slow and we turn and then I remember something and turn the window lock off (it had been hit accidentally) and the window comes up and we can concentrate and boy that was crazy and whoa I’m supposed to be turning left into the service road…. Breath. It’s Ok. Just go. And we did. Stage 1 complete. No longer a stage rally virgin. Stage 2 had an uphill into a Left 2 and what Kathryn noted as a “tidy” left. I told here there was no way that left was going to be tidy and I was right. It’s on video. I’m all over the place and I am going to blame it on the choice to run our most worn tires to save the “better” ones for gravel. But still, ugh. At least I didn’t put the car into a pond. That happened to the Audi 90. There are great photos. Stage 3 was a repeat of stage 1 but with no window issue. So I felt pretty good about it. And we floored it down the straight and around the back through the gravel but now I see in front of me a Saab 96 and I catch them on the gravel and end up following them down the final tarmac S turns and my time is slower this time because I caught the Saab but could not pass it. Stage 4 was abbreviated and changed from the original course and from the parade lap. And we got lost. There was a sort of figure 8 which was in fact two 90 rights in an X configuration but we got lost going into the first loop and flailed around and lost time but did not get stuck and did not plow into a hay bale or a pond or another car and we finished the day without finishing the rally on day one so it’s all good. After stage 4 we packed up service, loaded the car back onto the trailer, lost my iPhone, and drove out of Portland to our hotel in The Dalles, coming in around midnight, ready for day 2 when the rally really starts. For years, I’ve run my 02 WRX in TSD events. And I loved it. Modern engine, all wheel drive, AC, etc. It was great. But it was also my daily driver and as wear and tear increased and the car started to show it’s age, I entertained the possibility of following a few of my TeamD compatriots in getting a car I could dedicate to the cause. And in the back of my head wavered this seed of a thought, a small tickle in my fingers, the possibility that if I got a different car, perhaps one with a cage, I could consider a different kind of rally. We’ve talked about the different types of rally before. TSD is Time-Speed-Distance rally which is a precision event. Teams try to match their car to the theoretical perfect Car 0 time and get points off for every second either fast or slow. Stage rally is a bit different. In sailing, TSD would be predictive log racing while Stage would be traditional racing. There’s the same/simialr route book and notes but in Stage Rally there are no proscribed speeds and no theoretical Car 0. Roads are closed to traffic and the fastest car wins. In TSD, as the speeds are at or below the legal limit, no extra safety equipment is needed. Anyone with a daily driver can enter and be competitive in their class with minimum modifications and risk. In Stage rally, with high speeds and more risk, more safety equipment is required. Full roll cage, helmets and head/neck restraints, 5 point harnesses, etc. So with that in mind, well not really in front mind but there nonetheless, I started looking around for a car that might be suitable for TSD and legal for Stage Rally. 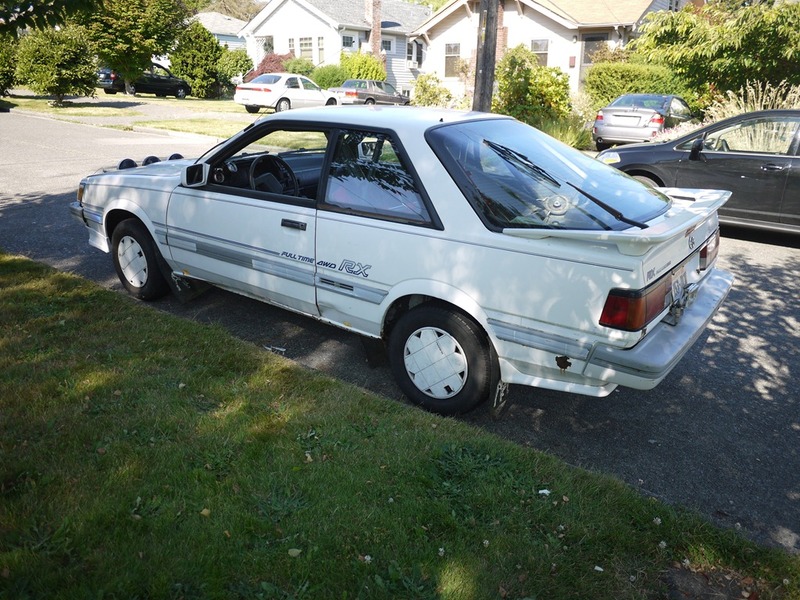 And after flailing around, I decided to buy Ron Sorem’s venerable 1987 Subaru RX. At 25 years old, the car is getting up in years but it has a history. 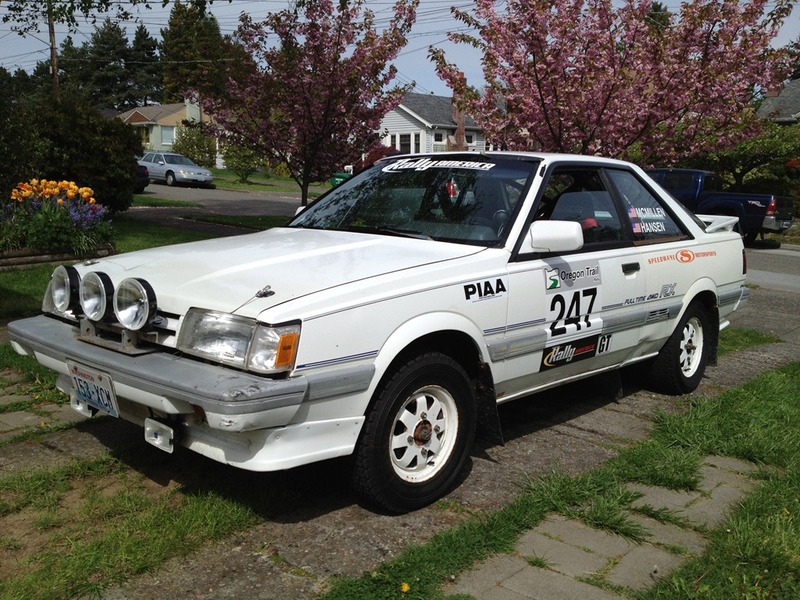 Back in the early 1990’s Ron campaigned the RX in the SCCA Pro Rally series. This means that the car had a cage and seats and harnesses and all that already in place. But, it hadn’t been run in many years and a number of updates were necessary. Still, undeterred, I bought the car and eased it (rusty brake rotors, sticky clutch, old tires, dead battery) back home. My wife immediately christened the car “The General Lee” and threatened to put a giant Confederate Flag on the roof. She’s from New Zealand and has no real direct experience with the deep south as depicted in The Dukes of Hazzard but the name choice was partially a joke and partially a comment on the “rust bucket” state of the car. Undeterred, I’ve slowly worked on the car, getting it back to a state that is serviceable. First a trip to TeamD sponsor Smart Service for a complete fluid replacement and some brake caliper service. Next a visit to new TeamD sponsor Speedware Motorsports for a new front driver’s seat (replacing the old one that is still acceptable but the seat angle was not where I wanted it – so the stock mounts were removed and Speedware welded in new mounting points). 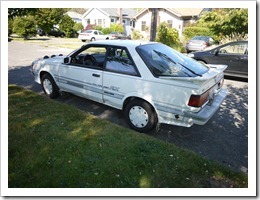 With the car back in shape, Marvin and I took it up to the 2011 Totem Rally. We made it through the weekend but the results were not as high as we have come to expect with the WRX. Much of that was due to getting familiar with the new car. And I guess I was unhappy with the exhaust system. So much so that I removed it with a snow bank. After Totem the car took a trip back to the original cage builder, Dave Clark, to update the cage to current regulations. This required the addition of sill bars and Dave suggested some A Pillar supports as well which he added. While there, I had Dave redo the exhaust and chop up the stock steering wheel to make a mount for the new Sparco wheel. Also somewhere in here I installed a Peltor headphone amplifier and a Terratrip 2 rally computer. Both components were added not for TSD rally but for stage rally. And I focused the car toward the 2012 stage season. With all that done, we took the car back out to the 2012 Thunderbird Rally. And we did better. I was getting more comfortable with the car and Marvin was getting more comfortable with his uncomfortable navigator seat. But still there was more to do. The main mechanical problem at Tbird was the front suspension. “Stiff” was how Ron had described it. But the coilovers felt more like steel bars than springs/struts. So the car went up on jack stands and I started the process of learning how all that suspension stuff was put together. I’m not very mechanically inclinded, focusing more on electronics than steel and fasteners, but eventually I was able to remove the coilovers and bring them over to JVAB Imports to be rebuilt. John of JVAB has built the system for the car back in 1992 and took on the job of rebuilding them. He sent the struts out to Bilstein to be revalved and tore apart the cylinders, welding on new fronts and doing all sorts of other magic. Now they are back on the car and the front actually moves around. It’s like night and day. So now the car is ready. And none too soon. The Oregon Trail Rally is this coming weekend. The decals are on the car. The wiring is complete. The suspension works. And Thursday morning we head down to Portland. More on that soon. Just got a quick note from Kathryn’s phone with the following summry. Cars 2 & 21 blew up at ice race yesterday. PE engine, Dolmage clutch. Cars 14, 15, 16 went to Tuk & missed rest of event. 19, too? Car #2 (Eklund) set fastest lap time at the Valdez slalom, then retired with a blown engine. We assume a DNF (Did not finish) for them but the rules are unclear and it may be that they take max penalty points for any remaining TSDs. If there are more TSD sections on the last day, this means they lose their lead position. Car #12 (Vaysburd) set 2nd fastest slalom time, only a couple of seconds off Eklund’s pace. Car #9 (Stenhouse) had a roll on the slalom. Driver is ok, and the Audi appears to be sound enough to finish the event. Car #14 hit a tree on the Blackwater on day 2. They picked up a rental in Kelowna and made it to Inuvik and Tuk. Car #13, 15, and 16 waited out the road closure on the Dempster to make the Inuvik trip. The last we heard (Annete’s Blog) car 13 was headed for Valdez to catch up with the rally while 15 and 16 stayed at Tok last night and will join the event at the finish. They will max out points on missed TSDs, but completed the ultimate drive north. 5 Elder Elder 955.2 19 6 SOP Are We There Yet? 10 Flores Flores 74.3 5 1 1 Are We There Yet? 13 Davidson Dubreuil 639.2 15 3 1E Are We There Yet? 17 Simpson IV Jorkensen 730.7 16 4 SOP Are We There Yet?